To assist all households that desire to install solar energy generation at their homes. To learn from the experiences of others. To teach others how to design, plan, permit, construct, and monitor a solar project. To lower the costs of solar energy by obtaining purchasing discounts. To lower the costs of solar energy by sharing in the labor of installation. To monitor and share news about advances in technology. To cooperate with other institutions that are encouraging the installation of solar energy. To demonstrate a commitment to change our impact on the environment and mitigate the trends in climate change. • David Rouse – see a picture in the postings. Search “solar”. Search for Yes Club, click on Yes Club. Don’t panic, the screen asks for your Log-in ID. Click on Public Sites at bottom left. You now have access to all installations that the owner has given access to the Public. In the Search box, Zip Codes, City, or Name of site. Click on the site for the Dashboard for details of Power and Energy graphs in several formats. Also available is the Layout of the PV panels. Look around. Has a program to reduce the interest rate on loans for home improvements that include solar installations. This program supports the Ohio economy by stimulating businesses that provide products or services to the homeowners. In addition, the program helps homeowners save money through lower interest rates and possible energy cost reduction. The program also allows for the revitalization of communities through the investment in existing homes and properties.ECO-Link is not a loan from the Treasurer’s office to the homeowner, but rather a strategic investment with participating lenders designed to promote a healthy state economy. After raising funds from the community to install 42 solar panels at the YES Club in downtown Newark, during the week of July 16, 2018 we worked with YES youth to complete a colorful mural on the YES Club exterior wall about the benefits of solar and put up signage about how solar works. Special thanks go to the many who worked on the YES for Solar! project, including: Richard Downs, Jeremy King, Julie Mulroy, Ken & Carol Apacki, Tracee Laing, Paul Hammond, mural artist Gayle Childress, Olivia Aguilar and her Denison Environmental Class, David Rouse, Tom Evans, Concerned Citizens of Licking County: The Solar Co-op, Mental Health America of Licking County, the Licking County Foundation, and most of all, the YES Club youth who were our artists and inspiration for the mural. Denison students present their research on how to promote solar. Gayle Childress and Tracee Laing and Olivia Aguilar mix the paints. YES youth begin the painting. Carol Apacki, promoter, presenter, and primary brush washer. The graphic explaining how solar produces electricity for the YES Clubhouse. Presented by Jeremy King and Richard Downs. It has never been a better time to think about solar power for your home or business. This presentation will dispel the myths about solar and help you better understand how and if solar is viable for you. announce the results of an exciting partnership with Habitat for Humanity-MidOhio. recently completed, and a “solar turn on celebration” is planned for April 19th in Newark Ohio at 3 PM. performance and long lasting solar solutions using its optimized design process. March 2018 Video by Jeremy King. THE 2017 YEAR-IN-REVIEW U.S. SOLAR MARKET INSIGHT IS NOW AVAILABLE. U.S. Solar Market Insight™ is a collaboration between the Solar Energy Industries Association® (SEIA®) and GTM Research that brings high-quality, solar-specific analysis and forecasts to industry professionals in the form of quarterly and annual reports. Each quarter, GTM Research gathers a complete account of industry trends in the U.S. photovoltaic (PV) market via comprehensive surveys of installers, manufacturers, utilities and state agencies. The result is the most relevant industry data and dynamic market analysis available. The U.S. Solar Market Insight™ Reports are offered in two different versions – the Full Report and the Executive Summary. The Full Report is available for purchase individually or as part of an annual subscription. Installations by market segment for 41 states plus Washington, D.C.
Want access to all of our U.S. solar research and data? Email solarsubscription@gtmresearch.com for pricing and a demo. 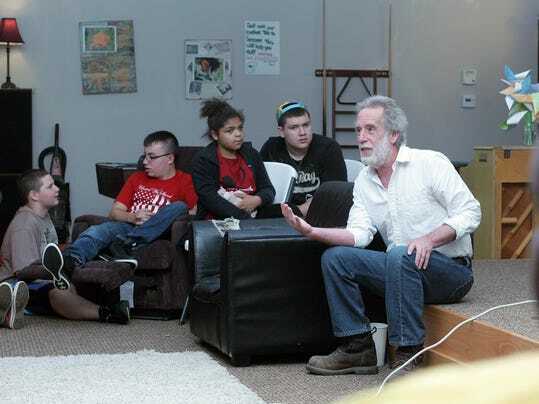 Dr. Olivia Aguilar’s Environmental Studies Practicum class at Denison University is working with the Solar Co-op to educate YES youth about the solar panels on their YES Club roof in downtown Newark. Denison students are also helping develop a plan for signage at the YES Club with information about the impact of the 44 solar panels on saving energy. Dr. Aguilar’s class recently presented Tracee Laing and Carol Apacki, members of the Solar Co-op with an overview of what kinds of signage can be most effective, based on students’ research and discussions with YES Club youth. –a flip-book with detailed facts and figures that can be shared with visitors. Working on the YES for Solar! was an experience of community in action. It all started with one person’s good idea. Last year Richard Downs came to our Licking County Concerned Citizen group and told us that the YES Club’s roof was perfectly positioned for solar panels. And when he offered to install the panels if we could help raise the money to purchase the materials, it was hard to say no. That’s when his good friend Jeremy King, a member of the Solar Coop and Sustainability Coordinator at Denison University, got involved, too. · Denison University designed and printed our materials. · Newark city officials guided and helped us through the permit process. Within a 2 ½ months, more than $24,000 in cash was raised, along with the expertise and generous in-kind contributions from local roofing companies, contractors and electricians who worked with us. The results of this wonderful community effort are 42 shimmering, shiny, solar panels providing love and warmth to the YES Club youth. They are also the first solar array in downtown Newark. These panels will substantially reduce the YES Club’s utility bills for the next 25-30 years, AND as the YES Club youth monitor and learn about this new technology on their roof, they will be at the forefront of the future. Yes for Solar panels are producing power. On a sunny day, the array provided 62 kilowatthours (kWh)of energy for the Yes Clubhouse. Net metering is the policy that enables a homeowner to be credited by their utility when they generate more electricity from a solar array than they use. You would think that those who go solar would be celebrated as heroes – because if everyone who could go solar did go solar, we’d all have a lot better shot at a livable climate. But instead, a nasty campaign of rumor-mongering is trying to take these true heroes down. The theory is that only the wealthy can afford solar. And as the rich leave the grid, the shared grid costs are split between fewer customers so the rest of us pick up the cost. The full range nationwide was from those with incomes ranging from $30,000 to $90,000 per household. In part, this is because it is not money you need to go solar but a good credit rating, of 650 or more, and good credit ratings are actually found across most income groups. The benefits of Community solar programs are open to all. These have no credit rating limits, and are open to all who want to cut their long-term electricity bill with a solar subscription, one panel at a time, on a pay as you go, leave when you want basis, funded by savings in electricity costs as you increase your solar supply. The rise in community solar programs is evident in states as diverse as Louisiana and California. #2 Myth: Too much solar will take down the grid! With so many rooftops generating solar during the day, this idea is that the grid would be just completely overwhelmed by the surplus daytime electricity, and blow out transformers, etc. Fact: Yes, this would be a new problem. Millions of individual choices can change the world. Look at how landlines are becoming a thing of the past with cell phones and VoIP. But we have thousands of years of evidence that we are actually capable of working out new solutions to new problems, or we’d never have survived the invention of fire in the first place. The grid is a publicly shared space, and when it was originally set up with centralized generators, it was easier to predict and control how much energy was let loose on to it. But there’s centralized planning, and then there’s what happens when millions of people make individual decisions to buy something that saves them money. There’s already an easy fix – storage. As we add more solar, there will be more innovations about how to redirect it to where and when it’s needed. Storage in batteries, (or even saltwater) not necessarily to go entirely off the grid, but to reduce grid power by more than just daytime generation is one option that will become affordable well before the level of solar becomes an issue. A cheaper option in use already is using surplus solar to heat water. This cuts the 60% of the average homeowners’ gas bill that goes to heating water, increasing the financial benefit of solar. Net metering has been gone for years in New Zealand, and surplus solar is only paid at the wholesale rate. Solar installers there routinely offer to hook up the hot water heater directly for heating with daytime surplus, essentially storing solar in water. Heating hot water with electricity may seem silly when you have gas to heat your water as in most of the US, but switching to electric water heaters and using solar saves not just the fossil fuel fracked from under our feet and then burned at big central power stations, but also the fossil fuel we overlook piped right in our homes. The black think-tank National Policy Alliance claimed that net metering policies harm communities of color in particular and low-income communities in general. Fact: Two-thirds of black Americans live within 30 miles of a coal plant. Low-income communities and communities of color are much more affected by the lack of clean energy on the grid, because the alternative electricity is dirty energy. Overwhelmingly it is African-American and Hispanic communities whose health is most adversely affected by the proximity of nearby gas and coal plants belching out smog. Asthma rates increase the closer a person is to a gas power project, and the mercury from coal mining and from coal power generation have a measurable effect on IQ levels in children. These burdens are felt by the poor. As solar (and wind farms) replace this dirty electricity, air quality improves and with it, learning problems and asthma rates. The argument here is that paying for solar at retail rates has costs. But it doesn’t look at the economic value of the benefits. Numerous studies have calculated the cost/benefit of solar generation right where it is needed as a net benefit, disproving this much-touted myth. Fact: Net metering benefits outweigh costs. The economic benefits of local rooftop solar exceeds 20 cents per kWh, according to a report prepared by the state of Massachusetts Net Metering and Solar Task Force – higher than the retail rate in most states except Hawaii. An Energy and Environmental Economics study testifying before the Nevada Public Utilities Commission in July of 2014, determined that net metering had a purely economic net benefit for all ratepayers equally of $36 million. #5 Myth: Net metering raises rates. Volatile gas prices are primarily responsible for electricity cost increases, year on year, according to utility documents filed with state PUCs. These increased costs are passed directly through to ratepayers. Unlike the predictable set rates that utilities credit their net metered customers, utilities buy power from natural gas power producers in two parts. There is a set rate contract, designed to recoup the cost to build a natural gas plant. On top of the predictable set rate, however, utilities also buy natural gas at pay whatever gas costs at that time, then request rate rises to pass through those unpredictable costs directly to ratepayers the following year. Investment in big expensive power stations like new nuclear or new coal plants raises rates. By 2013, the Prairie State Coal Plant in Illinois had a cost overrun of 30% over its initial 2007 budget to $4.4 billion, the equivalent of costing customers up to $63.40 per megawatt-hour. By the time the Prairie State Coal Plant coal plant was finally finished in 2015, it cost $9 billion. Bottom line: Net metering is not the problem. It’s the solution. Richard: Concerned Citizens website will be a place to aggregate info on local arrays. 5 out of ca 100 in county already on website. info sharing, creating community, resource for new people. This will be an entry level NABCEP class and the first ever in county. The class runs from April 14 – May 21 and will be Tuesday and Thursday nights. Richard Downs will be teaching the class. Contact Tina Trombley ttrombley@c-tec.edu for more info. Class will cost $775. Incentives and state regulations Fed Res tax credit still on books to end in 2016. State regulators change means or little market for energy credits. Spin-off energy providers don’t have to honor net-metering agreements, however, you can break your contract if you install a solar system. The Co-op – Where do we go? We can have more regularly scheduled meetings and host them at locations where we’ve done installations Meetings can be planned around a central theme – like policy, site design, outreach (ex. yes club), incentives, etc. etc. SB 310 in Ohio has impacted renewables. There is a two-year freeze on legislation while the State figures out how it wants to treat renewables and energy efficiency. Liability issues. Either fall under the wing of a nonprofit or…. Clintonville delegation: if act like a group. Ins company can sue other ins co. Have safety session, wear proper gear, safety review before day starts. YES Club project brings up liability issues that will need to be addressed Ultimately, each homeowner has to decide the issue of liability and how it plays into using volunteer labor. The cooperative should probably look into this a little more. Richard is starting a PV business with a target price of $3 / W for simple systems. This price point will get 10 year payback with the tax credit and that seems doable. Richard’s hope is that cost of equipment and installation will drop so that the 10 year payback can occur even without the tax credit. Richard is still willing to do pro-bono work and is willing to allow homeowners to mitigate the cost of installation through direct participation and/or the use of volunteer labor from the cooperative Jeremy is still willing to organize meetings and do initial solar site analysis for anyone free of charge as this is part of his role at Denison – public outreach on sustainability issues. Jeremy will also work with Richard on some installations. From Amazon.com —In The Zero Marginal Cost Society, New York Times bestselling author Jeremy Rifkin describes how the emerging Internet of Things is speeding us to an era of nearly free goods and services, precipitating the meteoric rise of a global Collaborative Commons and the eclipse of capitalism.Rifkin uncovers a paradox at the heart of capitalism that has propelled it to greatness but is now taking it to its death—the inherent entrepreneurial dynamism of competitive markets that drives productivity up and marginal costs down, enabling businesses to reduce the price of their goods and services in order to win over consumers and market share. (Marginal cost is the cost of producing additional units of a good or service, if fixed costs are not counted.) While economists have always welcomed a reduction in marginal cost, they never anticipated the possibility of a technological revolution that might bring marginal costs to near zero, making goods and services priceless, nearly free, and abundant, and no longer subject to market forces.Now, a formidable new technology infrastructure—the Internet of things (IoT)—is emerging with the potential of pushing large segments of economic life to near zero marginal cost in the years ahead. Rifkin describes how the Communication Internet is converging with a nascent Energy Internet and Logistics Internet to create a new technology platform that connects everything and everyone. Billions of sensors are being attached to natural resources, production lines, the electricity grid, logistics networks, recycling flows, and implanted in homes, offices, stores, vehicles, and even human beings, feeding Big Data into an IoT global neural network. Prosumers can connect to the network and use Big Data, analytics, and algorithms to accelerate efficiency, dramatically increase productivity, and lower the marginal cost of producing and sharing a wide range of products and services to near zero, just like they now do with information goods.The plummeting of marginal costs is spawning a hybrid economy—part capitalist market and part Collaborative Commons—with far reaching implications for society, according to Rifkin. Hundreds of millions of people are already transferring parts of their economic lives to the global Collaborative Commons. Prosumers are plugging into the fledgling IoT and making and sharing their own information, entertainment, green energy, and 3D-printed products at near zero marginal cost. They are also sharing cars, homes, clothes and other items via social media sites, rentals, redistribution clubs, and cooperatives at low or near zero marginal cost. Students are enrolling in free massive open online courses (MOOCs) that operate at near zero marginal cost. Social entrepreneurs are even bypassing the banking establishment and using crowdfunding to finance startup businesses as well as creating alternative currencies in the fledgling sharing economy. In this new world, social capital is as important as financial capital, access trumps ownership, sustainability supersedes consumerism, cooperation ousts competition, and “exchange value” in the capitalist marketplace is increasingly replaced by “sharable value” on the Collaborative Commons.Rifkin concludes that capitalism will remain with us, albeit in an increasingly streamlined role, primarily as an aggregator of network services and solutions, allowing it to flourish as a powerful niche player in the coming era. We are, however, says Rifkin, entering a world beyond markets where we are learning how to live together in an increasingly interdependent global Collaborative Commons. Caution: At the Co-op meeting, someone mentioned that AEP does not have to honor “net metering” when you install solar electric power if you have a supply contract with alternative electric power suppliers. Walter and Diego stand on a roof about to get solar installed. When my son Walter asked me this question a decade ago, I would have no idea where it would lead, or what I was getting myself into. He and his friend Diego (both 12 years old at the time) had just seen the movie “An Inconvenient Truth” and wanted to take action. So, we looked into go going solar at our Washington, D.C. home. At the time, going solar was a complex and expensive process. About ready to throw my hands up, I said to the boys: “If we’re going to go solar, we might as well do our whole neighborhood.” Sure enough, they canvased the neighborhood and signed up 50 neighbors who expressed interest. This is how the Mt. Pleasant Solar Cooperative got its start. We worked with our community for two years to get solar installed. It wasn’t enough to learn about the technology and financing of solar. We also had to fight for policies that ensured our solar rights. Our community’s success in these fights has made D.C. one of the best markets in the country for solar. This community formed DC SUN (D.C. Solar United Neighborhoods). Anya Schoolman displays a Mt. Pleasant Solar Cooperative sign in 2007. As it turned out, the idea of going solar together is really popular. We’ve worked with communities in Maryland, Virginia, West Virginia, Ohio, and Florida to create similar efforts under the umbrella of Community Power Network. Today that changes. We are proud to launch Solar United Neighbors. The name Solar United Neighbors is a perfect reflection of who we are and what we stand for. We envision a clean, equitable energy system that directs control and benefits back to local communities, with solar on every roof and money in every pocket. 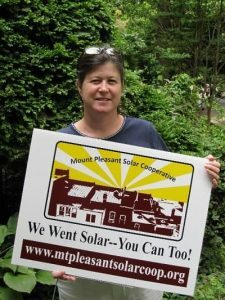 We help people go solar, join together, and fight for their energy rights. This rebranding is just one change. Our work is spreading to Minnesota, New Jersey, and Pennsylvania. We look forward to engaging with these communities soon. 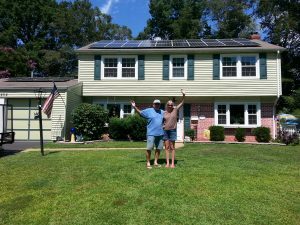 Solar homeowners celebrate their new installation. We are expanding the ways we help people go solar in addition to expanding geographically. Our new membership program will give people more choices to get help going solar with us. It will allow us to help solar homeowners through the lifetime of their systems. But most importantly, it will enable solar homeowners to form a powerful community to support solar. Many of you will remember that last spring Richard Downs, Chris Ramsey, some Denison students and a number of others in our group were working with Habitat for Humanity to develop a program to put solar on Habitat Homes. We laid a lot of ground work and got as far as identifying a house in Newark. The project stalled on the Habitat side of things, but Mid-Ohio Habitat shared the idea with Third Sun (who is building the Denison array) and they took up the gauntlet and launched a new program. This wouldn’t have been possible without the original idea and Richard and team should pat themselves on the back for paving the way. I have since learned that the Newark house we identified is on the list to be one of the first to get an array – let’s all hope that happens as that family is both interested and deserving. Third Sun Solar is proud to announce an exciting partnership with Habitat for Humanity-MidOhio. From now through the end of 2017, we will donate one solar panel to Habitat for Humanity-MidOhio for every residential solar system sold. We expect 2017 to be the biggest year ever for U.S. solar installations. We believe that partnering with Habitat for Humanity in this way will not just reduce the utility costs for these hard working families, but will bring needed attention to solar and help us to further accelerate the shift to clean energy that is catching on in the Midwest. This crossed my desk at Denison and I thought many of you might find it useful either for your own knowledge and/or for the work that you do professionally. It’s a lot of data, graphs and charts, but it is a wonderful resource. It does a decent job of showing average solar radiation for a rooftop that includes possible shading issues and roof orientation – the magic of GIS data. We had a good meeting yesterday with lots of updates and lots of great ideas. Commercial solar installations are exempt from real property tax in Ohio. Residential systems are exempt in Cincinnati and Cleveland, but nowhere else in Ohio. This means that the value of a residential system could be included in the value of your house/property. This doesn’t mean that a taxing authority is going out of its way to include the value. I can say from personal experience that Licking County has yet to document my array as part of its assessment and others have had similar experiences. What probably does happen, is that an array may allow you to put a higher price on your home/property when you sell it and thus, the buyer pays more. This sale price can eventually have an impact on property valuation done by the auditor. 2) There is interest in doing outreach and activism around energy policy locally and beyond – we decided that reaching out to a number of new organizations that have mobilized on environmental and social issues after the election to hold a broader more inclusive meeting, would be a good next step. It would be good to explore how our group and others can collaborate. Mark your calendars for Sunday, March 26 in the afternoon. We’ll tentatively plan our next meeting for then and this meeting will focus on policy and outreach efforts. I’ll work to invite other interested groups. Another idea that was floated after the meeting that warrants further exploration would be to arrange a private tour of specific solar arrays for some of our elected officials in Licking County. With some strategic advance planning, we can turn an event like this into an opportunity to promote solar and energy policy with these officials. This may be best done after the Denison and Newark arrays are completed i.e. this Fall.